I agree with you in many respects with this. The Apron is a beautiful symbol of innocence. Where I am from, there is no set "rule" for when to wear it, though I feel there should be. Instead, I have mine in the closet, in a blue tube that I take out to show my sons on occassion. It's getting warped from being rolled so long. 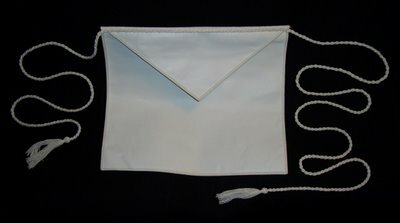 I have actually thought about buying one of my own for lodge use, but at nearly $300 for a real (non synthetic leather) apron, it's been a bit out of reach. In my naivity, I did not realize that the one given at our initiation may not have been real leather, but a synthetic. It has the smell of leather, as far as I know it. 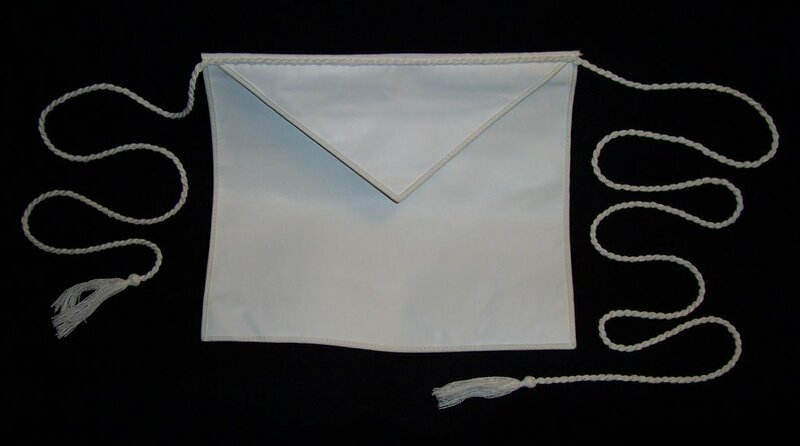 Do you have any links or stores where one can purchase a real leather masonic apron, of the standard style? White Cotton Lining. White cotton marrowed stitching around flap and body. Bound at top with grosgrain ribbon. Size: 13" x 15". Price per dozen. Aprons are made to order. Allow 4 weeks for delivery. But notice the price, $489 which is for a dozen. My guess is that they can be made for less, but you would have to source someone. But I think people are leary about buying their own and rather use the lodge aprons. Off hand, there is no restriction on which apron you can wear, your own or a lodge loaner. Some places overseas EXPECT you to have your own believe it or not. Thanks for the info on where to get these aprons. Out of curiosity, what are the primary reasons you would value use of an authentic leather apron in Lodge besides its symbolic meaning? The value, I think its a personal choice. I still use the lodge loaner, but have thought to get a usable lambskin, just to bring my own. Maybe it's just a pride thing to do it, just makes the experience richer. I dunno. when you get it, your suppsed to put it away for he FINAL time you wear it, when brother's from your home lodge or god knows where come together to commemorate your passing into the celestial temple. ie: your not supposed to wear it again til you die. Thanks! I feels that nature of this topic is very fine. Macoy sells the leather and lambskin aprons individually. Not just a lambskin. For me it was cherished moment in my masonry career that will look back on for the rest of my life.